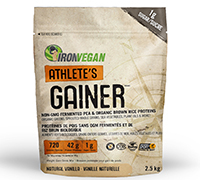 Iron Vegan's Athlete's Gainer was made with most ingredient conscious athlete in mind. Containing Non-GMO fermented pea & organic rice proteins, organic greens, sprouted whole grains, sea vegetable, plant oils and much much more! Athlete's Gainer has been thoroughly tested for banned substances and offers an remarkably smooth and creamy taste to help build strong muscles and repair body tissue. 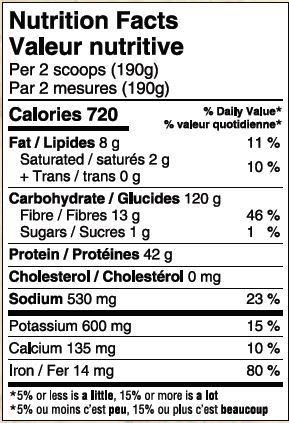 120g of carbohydrates per serving! *Natural Chocolate Flavour Shown. Ingredients may vary from flavour to flavour. Ingredients: Pea starch, Fermented pea protein isolate, Organic sprouted brown rice protein concentrate, Brown rice flour, Modified coconut oil(medium chain triglycerides), Inulin, Organic spirulina, Organic kale, Organic spinach, Organic coconut oil, Organic sunflower seed oil, Flax seed oil, Organic sprouted amaranth, Organic sprouted quinoa, Organic sprouted millet, Organic sprouted pumpkin seed, Organic kombu, Organic dulse, Organic nori, Tart cherry, Bitter melon, Pineapple, Papaya, Cinnamon, Ginger, Beet root, Xanthan gum, Natural and organic flavours, Organic stevia leaf extract.